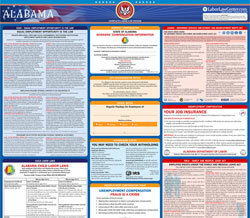 The Workers' Compensation Notice is a workers compensation law poster by the Alabama Department Of Labor. This is a mandatory posting for all employers in Alabama, and businesses who fail to comply may be subject to fines or sanctions. This poster must be posted in a conspicuous place and describes how to apply for workers' compensation in injured in a job. Information that must be provided by a employee include workers' compensation insurance carrier and telephone number of the employee. It appears you don't have a PDF plugin for this browser. Please see the link below to download alabama-wc-information.pdf. COMPENSATION LAW INCLUDING MEDIATION SERVICE. IN ONE OR MORE CONSPICUOUS PLACES IN YOUR BUSINESS.